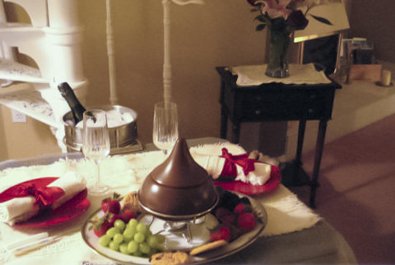 Romance with a Victorian flair. 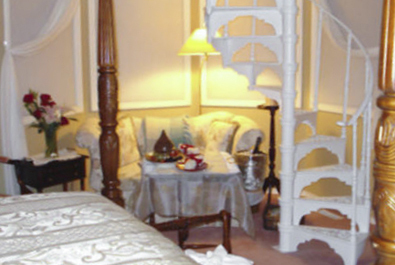 This large suite features a spiral staircase leading up to the top of the turret lookout with a view of the town. A bowed window sitting area serves as a comfortable hideaway for reading, daydreaming or enjoying a relaxing in- room breakfast. Dark mahogany furniture by Gibbard and a queen size four poster Thomasville bed with top of the line pillow top mattress and classic comforter makes this suite luxurious. The replica antique gas fireplace and full ensuite bathroom makes it cozy, inviting and private. 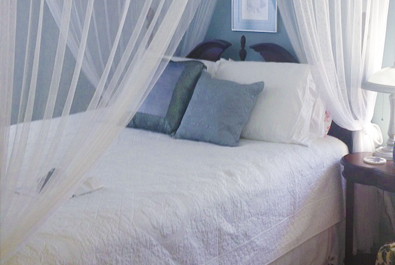 It is the perfect haven for relaxation or a quiet romantic getaway. Relax in the custom made arm chair with a good book or Soak in the private bath. Intimate luxury! Sink into a custom made mattress and experience sweet dreams under the cozy canopy and white down comforter in a dark cherry wood 4 poster queen size bed with a shared washroom. Please know that we have a little Dashund Dog named Lilly who lives in her own section of the house.